Kathy K. Wylie was born and raised in Ottawa, Ontario. After graduating from McGill University with a business degree, she moved to Toronto to begin a career in marketing with IBM Canada. Seven years later, Kathy resigned from IBM to stay home and raise her family. It was at this time that she began quilting. It was love at first sight. Quilting was a combination of so many things that Kathy enjoyed: sewing, needlework, fabric, colour, graphic design, even math! Quilting became her passion. Within four years, Kathy was teaching quilting classes. She began by teaching a small group of ladies in her church group. She now lectures and teaches all over Canada at guilds, shops, and quilt shows. Kathy has been a guest-artist in residence at The Elly Sienkiewicz Appliqué Academy and a faculty member at Quilt Canada. Her focus is on teaching skills and techniques that will develop other quilters. 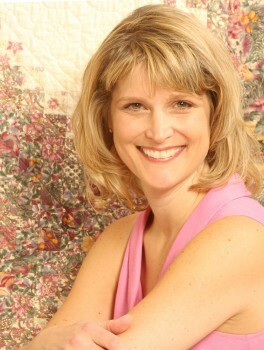 Kathy is a Canadian Quilters’ Association Certified Quilt Judge. Kathy began showing her work in 2002. Her first entry into international competition earned a third-place ribbon. She has continued to exhibit her quilts and has received recognition in Canada as well as internationally. Her quilt Instruments of Praise earned the 2011 Bernina Machine Workmanship Award from the American Quilter’s Society and now resides in the U.S. National Quilt Museum as part of its permanent collection. She was honored to receive the 2011 Founders Award from the International Quilt Association and the 2013 Best of Show Award from the Canadian Quilters Association for her quilt Flourish on the Vine. Kathy is the author of Sewflakes: Papercut Appliqué Quilts (C&T Publishing, 2007), Flourish on the Vine Pattern Pack, Instruments of Praise Pattern Pack and has released other patterns in print and online. Her work has been published in magazines, including Quiltmaker’s 100 Blocks and on the April/May 2012 cover of Quilters Newsletter. Kathy is interested in a broad spectrum of quilting techniques, but her style would best be described as “contemporary traditional”. As Kathy has developed as an artist, her work has taken on a distinct focus. Using Biblical imagery and spiritual themes, Kathy’s quilts are a reflection of her relationship with God and her journey of faith.